I have only tried one other “copycat” recipe for those famous recipes that so many of us wish we could get our hands on the secret recipes. It was for the coleslaw recipe from KFC. 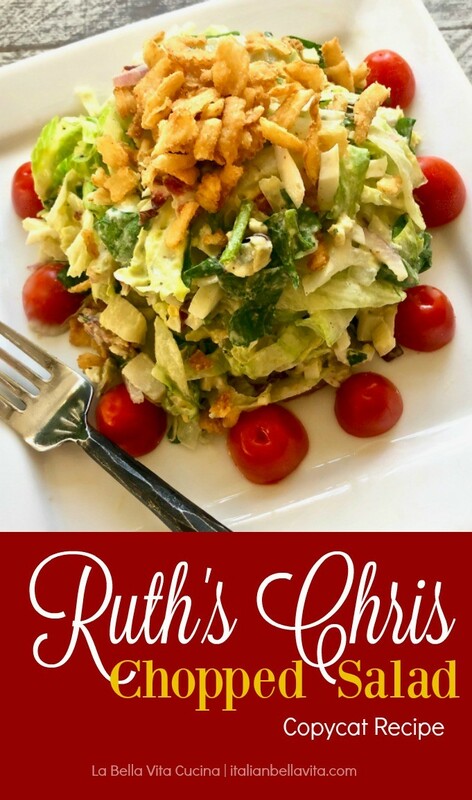 And just like this copycat recipe for the Chopped Salad at Ruth’s Chris Steakhouse, it was spot-on delicious! I’m always a little bit skeptical of recipes that say that they are a good duplicate of a cherished professional recipe. But I have to say that I’m batting 100% with the two copycat recipes that I’ve tried. Now I don’t know if you’ve dined at Ruth’s Chris or not, or if you are a fan of the restaurant or not. It is hands-down our favorite steakhouse in our neck of the woods. We’ve never had a bad experience or meal at the location in Greenville, South Carolina. 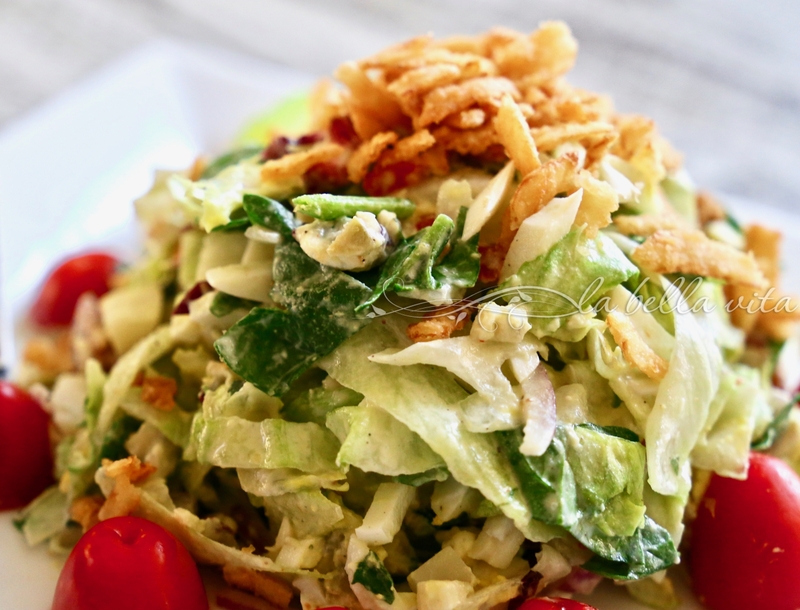 Along with one of the famous steaks, we religiously order the house Chopped Salad. I’ve always wanted to prepare this salad and I finally did today. I have to say that if this is not the famous secret recipe than it is pretty darn close. And it’s wonderful to my taste buds! This colorful chopped salad combines layers of flavor with spinach, radicchio, and iceberg lettuces . . . mixed with an assortment of chopped artichoke hearts, green olives, hard-cooked eggs, hearts of palm, bacon, red onion, crumbled blue cheese, and dried onion rings. The creamy, yet slightly tangy dressing is perfectly light with lemon juice, basil, seasoned salt . . . and I add some garlic powder. To make this salad even more of a sensory experience, there is this wonderful crunch from the dried onion rings and thick bacon. And my husband and I love ‘crunch’ in our salads. I might even add some slivered almonds to this the next time I prepare it. I guarantee that I’ll make this chopped salad again and again now that I have the recipe! What’s great about chopped salads is that when you take a bite, you get all of the flavors at once including the dressing. So if you’re in need of an incredible salad that can be made ahead, trust me, this chopped salad is a keeper! And talk about a great salad for entertaining since you can make everything ahead of time. Just toss everything before serving to your guests so that the lettuces don’t wilt and the bacon doesn’t get soft. Let me know if you make this salad! I’d love to know what you think! And as always, send me a photo and I’ll share it here for the community to see! Start with a nice blend of your favorite lettuces, such as your go-to iceberg if you enjoy more crunch. Then add some romaine, spinach, red leaf, red cabbage, and/or mesclun. Some are more earthy lettuce than others and some have more flavor and zing than others. It’s good to have a good balance. Choosing and prepping great greens is the first step in salad excellence. Don’t buy lettuce that’s browning or has bruises. Notice if the edges of spinach or mesclun have yellowed, and skip those. We really dislike the taste of packaged lettuce, but if you like them and are in a time-crunch where you need to use those pre-washed lettuces, then do make sure to check for condensation in the bagged lettuces, because moisture in the package means the greens inside will soon wilt. Whenever you’re making a salad, it’s always best to use lettuce that has been washed and dried, not wet or damp, so that the dressing/vinaigrette can cling to the lettuce better. You want to remove any of the grit in lettuces from growing in the dirt, so don’t skip giving them a nice bath. Fill a huge bowl with cold water. Tear apart the leaves and swish them around in the water, then let them rest for a few minutes so any released dirt can settle at the bottom. Lift the greens out of the bath and place into a salad spinner. One way to make sure that your lettuce has the grit and rinse water ‘gently’ removed is by giving the lettuce a nice little whirl in a salad spinner. You may have to do this twice. Dry washed lettuce well in that spinner. Throwing a paper towel in with the leaves helps absorb water. Take this seriously—for chopping, lettuce has to be totally dry. I have been using the same salad spinner to dry off lettuce for decades now. Add more chopped vegetables. Be creative and go beyond the basics of carrots, avocado and tomato. Throw in some chopped red and green peppers, broccoli, radishes, cucumbers, broccoli, or radishes to add some extra crunch. Beets add more color and nutrition to the salad. Adding fresh fruit adds a welcome sweetness to any chopped salad, while dried fruit can contribute chewiness and tang. Cheese is always nice in any salad, ranging from manchego, asiago, pecorino, feta and parmesan to blue cheese or gorgonzola . . . all which add more tangy zing to your mix and make your chopped salad even more extraordinary. Don’t use too much to prevent the cheese from overpowering everything else in the salad. Add good quality meat to anchor your salad. We use a lot of thick, crispy, crumbled, smoky bacon in our salads. Add hard-boiled eggs that really make a salad sing. Make a crunchy impact by adding dried onion rings, crispy wonton noodles, croutons, tortilla chips, slivered almonds, cashews, or peanuts. Use a large chef’s knife or a mezzaluna on a wooden cutting board to chop everything up. Chop ingredients to the size that you prefer. When dressing a chopped salad, spoon or drizzle a few tablespoons of dressing into the mix and then toss the salad. You want the dressing to coat the ingredients without bogging them down. Taste a bite as you go, adding a little more dressing and then some freshly cracked salt and pepper to finish. Serve chopped salads right after tossing. Seems simple to prepare and looking so very appetizing! It really is simple Angie! 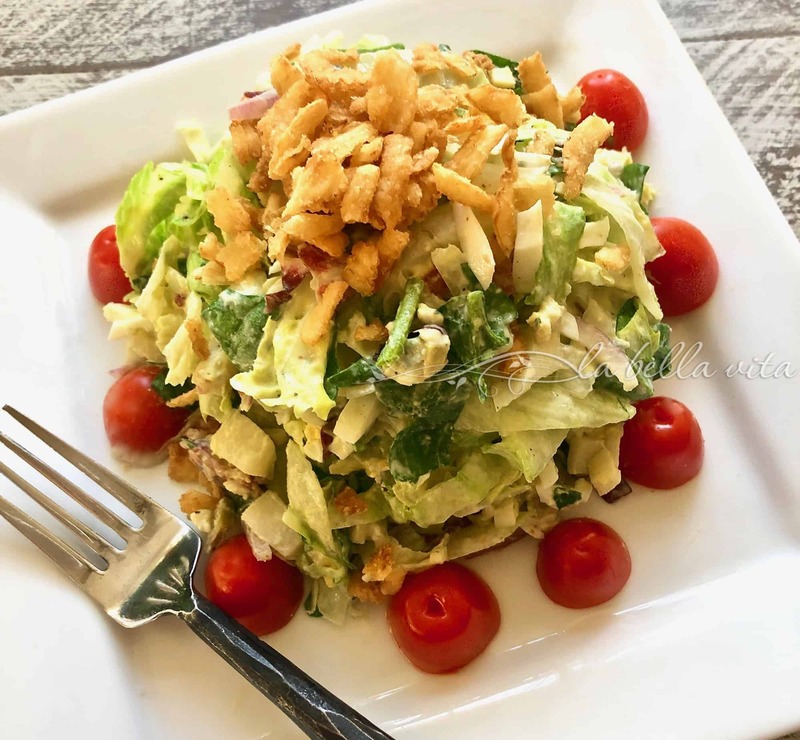 We love Ruth’s Chris Steakhouse salads and love this chop salad ! Pinning this recipe!! 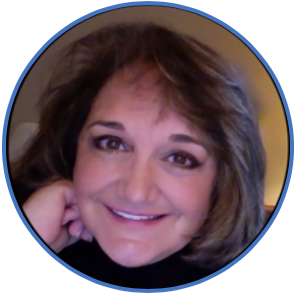 Thanks Roz- have a great week! Pinned the recipe as I’m a real salad person. One question, about how much basil did you use in the dressing? Use ½ cup of basil, but it’s always a taste thing. I know you’ll love this since you are such a salad-lover! This salad dressing sounds amafzing. What a beautiful salad.. So nice to have you stop by, you’re an excellent cook and I appreciate your thoughts! And beautifully arranged . Yummm Thanx for sharing .. Please send me a photo and let me know what you think of this copycat recipe please! I have to say that Ruth Chris is not my favorite for steaks, but everything else I’ve had from there was delicious. (Went to the downtown location and felt it was overrated.) Well you make this salad sound so good that I’m going to have to try it. I totally understand that we have bad experiences where others may have had good experiences. All I know is that I love, love, love the house chopped salad at Ruth’s and wanted to be able to prepare it at home. Again, if this isn’t the real recipe, I think it is pretty darn close and I do recommend it. It would be so great if you could let me know what you think and what you felt needed to be changed from this ‘copycat’ recipe (it’s not mine and I make sure that I make that known to everyone). Let me know also, if you don’t mind, what your favorite restaurants, even if local which my husband and I prefer over chains. Thanks for writing to me, Kym! You’ve got a deal: I’ll look for the recipe for their Caesar and let you know! I love fun (and delicious) challenges! And I’d love to know how you prepare such wonderful steaks at home! that’s impressive! I’m still on the prowl looking for the recipe. As soon as I find it, I’ll be happy to share it! Joanie, the blue cheese crumbles are listed in the ingredients underneath ‘green olives’. The croutons are the dried fried onion rings.